Dates: 11-18 January. Venue: Alexandra Palace. Coverage: Live on BBC TV and online. 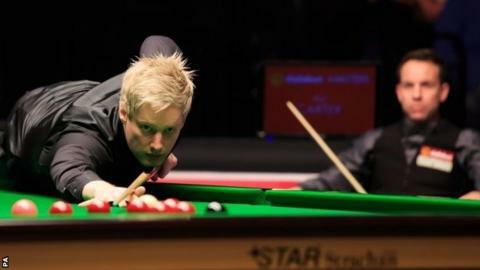 World number one Neil Robertson put in a stunning performance to defeat Ali Carter 6-1 in the quarter-finals of the Masters in London. Robertson was in sublime form, compiling two century breaks plus three further half centuries to complete a comfortable win at Alexandra Palace. He now faces Ronnie O'Sullivan in Saturday's semi-final. Carter was given the all-clear in December after developing a cancerous tumour on his lung. He missed the first five months of the season, but won the General Cup, a non-ranking event held in Hong Kong in October, before playing in the invitational Champions of Champions event in November and the UK Championship later that month. 'The Captain' was superb in his first match in this tournament, trouncing Barry Hawkins 6-1, but he came up against a formidable opponent in Robertson. The Aussie had a pot-success rate of 97% in making frame-winning contributions of 128, 57, 98, 127 and finally 84, as he seeks a second Masters crown to add to his 2012 triumph. Earlier, O'Sullivan scored his 776th career century to break Stephen Hendry's all-time record as he defeated Marco Fu 6-1.